If you’re reading this in your email inbox or from an RSS reader, this would be a good time to drop by and visit, but read on to the bottom of this post because there are some extra subscription instructions for you to make sure that you’re getting the right updates. As we all know, change isn’t easy, and it’s the same when it comes to blogs. Changing from a wordpress.com-hosted blog to a self-hosted blog is tough stuff, and I have yet to make it all work, so in the meantime, please please please be patient with me! So until I get them fixed, you might encounter some of these problems. Sorry about that! Please give me a week or so to figure it out. If you’re currently reading this post on your RSS reader, this means that you have the old feed. You can subscribe to the new feed here. If you’re currently reading this post in your email inbox, you need to re-subscribe here. Thank you so much for reading. I’ll be redirecting this old site in the coming days (let’s hope it works), so I hope to see you in the new site! Here’s to more years together! I’m excited that Christmas is just around the corner! Christmas is a wonderful time to spread the love and cheer, and it’s also a great opportunity to create memories with loved ones. Today, I’m blogging about what our family has done in the past so you can get some ideas. Every Christmas Eve, our Claudio clan comes together to celebrate. We exchange gifts and eat lots of food, like most families. Two Christmases ago, we decided to add something extra and share what we were most grateful for in the past year. In a clan of 30+ people, it helped us to get to know a little something more about each other and in the process, thank God for all the blessings He has showered on our family. Last Christmas, we had extra time to spare, so I got an idea to do something fun. I recruited my art teacher friend Linny to help me make some plain top hats out of black cartolina (known in other countries as cardstock or construction paper), then I emailed our relatives to tell them to bring art materials and other props that could be glued. All we needed to prepare were some glue guns and we were ready! When they arrived, each person picked a top hat (the men got the taller ones), and we challenged them to come up with a creative hat using any of the materials that were available. I was blown away by how creative everyone was! Even the adults were into it! Talk about effective use of props! You’re welcome to try this out with your family this Christmas! My uncle–the adventurer extraordinaire Anton Carag, Jr.–was in the middle of briefing our family about kayaking and white-water rafting when I stopped to write what he had just said. I had a feeling there was a deeper lesson in there somewhere. Fast forward to today. I was busy developing a workshop that I’m giving next week to some students from the De La Salle-College of St. Benilde. As I was working on the talk outline, I realized that public speaking and teaching are both a lot like kayaking and white-water rafting. 1) Every river experience is different, just as every speaking opportunity is different. If you’re someone who teaches and speaks on a regular basis, it’s easy to lose your passion and just go through the motions. And when I lose my passion, I often end up preparing less and I’m tempted to simply “wing it.” But just as every river explorer has to enter the river alert, focused, and ready, a teacher and speaker needs to enter every teaching space with the same attitude. 2) Preparation will be your best friend. Before we started kayaking, we were given life vests and helmets to wear. After we put on our gear, Tito Anton briefed us on safety measures, then we were placed on kayaks near the river bed where we each had to practice falling. To tell you the truth, I was relieved at this exercise. For starters, getting dunked into the river helped me get used to the cold water temperature, and it helped me simulate the experience and realize that it wasn’t as scary as I thought it would be. In the same way, preparing and practicing a talk or a lesson can help lessen fears and help you prepare for possible obstacles. Am I boring myself in this portion of the talk? Then chances are my audience will start yawning, too. Do I need to insert a video or an activity to keep them engaged? Practicing and simulating helps me anticipate possible roadblocks and adjust as needed. 3) When you hit obstacles, you have to keep digging. The river has a lot of rapids and boulders that can cause the raft or kayak to stop, fly, or flip. My first instinct would just be to stop paddling and grab on to whatever I can until the obstacles pass. However, we were taught that when those rapids come, all the more we need to paddle harder. Or sometimes they would call out, “Dig!” because the intensity of the paddling that was required looks a lot like digging. In the same way, it’s easy to just trail off and change the topic when you hit roadblocks in teaching or speaking. Your students or audience look like they’re tuning out, their eyes glaze over, and blank looks or confused faces stare back at you. Instead of getting discouraged or resorting to rushing through the material, all the more we need to seize the opportunity to keep digging. It could mean asking questions to try to untangle what’s confusing the audience, or it could mean thinking of metaphors or analogies that will help the audience grasp your point better. Of course, the best time to do this would be during the preparation process, but in case you encounter obstacles in the middle of the action, don’t stop and don’t give up. Just keep on digging. 4) Speaking and teaching can make you nervous and anxious, but it can be fun and exciting. Although you won’t get to experience that until you put yourself out there. If you read my blog last week, you know that I wasn’t very excited at the thought of white-water rafting. I’m not a fan of open water, much less raging rapids. But now that I’ve tried it, I can say that I’m really glad I did. I had a lot of fun and I enjoyed going through the adventure with my family. It was definitely an experience to remember. In the same way, I’ve often found myself absolutely dreading upcoming talks and workshops. But I’ve pushed myself to keep on doing it because, for starters, I’ve been blessed to be able to learn from teachers, mentors, experiences, and books, and my heart is to share the knowledge to help others. And I can’t help but feel joy when a student tells me that they learned a lot (or something like that). It makes every moment of anxiety and every hour spent preparing worth it. Besides, I’ve also learned that feeling nervous is normal. It helps keep me grounded, too! 5) You’ll want to pray all the way. Are you a teacher/speaker/adventurer? Is there anything else you can add to this list? Should you go on a faith journey? This trip deserves a longer post, so I’ll tell you more about it in the coming days. I just need to wait for the rest of the photos that were taken during our kayaking and white-water rafting adventures. And I definitely need to catch up on some sleep. Haha. Did you have a long weekend? What did you do? I’m going white-water rafting with my relatives this weekend. I’m not all that excited. I love taking vacations with my relatives (when all 30+ of us travel together, it’s nonstop fun! ), but I’ve never been a fan of open water activities. I can do them, I just don’t seek them out. I think it has to do with the fact that, more often than not, I don’t know what’s swimming underneath my feet. 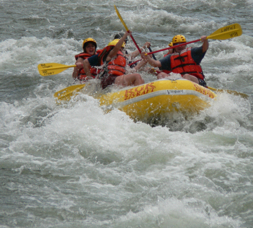 But then again…white-water rafting IS one of the things that I want to try at least once in my life. I posted a status message on Facebook, asking for recommendations on what to bring for a white-water rafting trip. My friend, Jorel answered, “NERVES OF STEEL.” Yep, I’m going to need some of those! How about you? What are some adventures that you want to try at least once in your life? Quest is a gifted artist and a dear friend, and I’m excited for his big album launch. I’m not the only one who’s excited for it–Quest (aka Jose) and I have worked with some scholars and students from Pasig and Tondo…I’m hoping to be able to bring some of them to watch their kuya‘s big night! Liwanag is a beautiful song full of hope. I can’t wait to hear this compilation, because apart from Julianne, it also features some of my other favorite artists: Urbandub and Kitchie Nadal. I really appreciate these people! In other news, I just returned from an awesome trip to China. It was another one of those faith journeys where I was stretched outside of my comfort zone. And I’m glad I went, because I was blessed with great experiences and wonderful new friends. 1) God is so good. 3) His grace is sufficient. 4) I am able to do more when I am not focused on my own problems and desires. 1) M.A.P.S. : The 4 Pillars of Creative Job Fulfillment by Jason Theodor @ the99percent.com – Good and practical career advice. 2) Ambition: Right or Wrong? by Brad Lomenick – Do you wonder if you’re too driven or you’re dreaming too much? Here are some good insights that’ll keep you in check. 3) Bowlin’ with Chris Tomlin – I wish I was at Catalyst Atlanta this weekend, but at least I can still enjoy the crazy videos from Catalyst hosts Tripp Crosby and Tyler Stanton. Here’s the first one they uploaded. Best appreciated if you know these names: John Maxwell, Francis Chan, Reggie Joiner, Mark Driscoll, Steven Furtick, and Aaron Keyes. 4) Love and Listen First by Sarah Markley – She hit the nail on the head. I want to be a better listener. …to a city I’ve never been before. …to meet people I’ve never met before. …to see sites I’ve never seen before. …to try to speak some words in a language I’ve never spoken before. I’m excited and nervous at the same time! Keep me in your prayers? Looking forward to sharing more stories with you when I return next week. :) In the meantime, the guest posts will keep on coming! I hope you’re enjoying them so far! The subject of this post is attributed to an interesting conversation at my friend’s birthday dinner. The dinner was filled with creative types because the celebrant was my uber-talented friend Chinie, who is a theater actress/singer/dance choreographer. Sometime in the middle of dinner, our friend Steve Cadd (who also happens to be a director, singer, actor and pastor–ain’t that an awesome combination?) offered an observation: he said you can tell what industry a person works in by the way he or she counts. We went into a technical discussion about the reasons behind each industry preference, but it just got me thinking about the importance of a prompt, a cue, or a signal to indicate that something important is about to take place. I read that verse a couple of weeks ago and I really liked it. God has a way of making everything beautiful, because right before I read that verse, this was the message that was playing in my head: CHANGE IS SCARY. But on the other hand, Spirit-led change leads to growth, hope, transformation, healing, restoration, renewal, and more. Change can be scary. But for us humans, it’s often necessary. I’m going through some changes in my life–some are major, and some are pretty minor. Just to give you an example of one of the minor ones, I’ve decided to make a change on this blog by revising its tagline. This blog’s tagline used to be “Thoughts on walking by faith, seeing with hope, and living with love,” but as important and valuable as these three are, I’ve realized that they simply serve to provide the backdrop and the feel of what this blog has really been about all along: LEARNING, LOVING, LIVING…and SHARING all of that. For now, I need to move out of my comfort zone. So today I will push my fear and discomfort aside, and move forward in faith. How about you? Is there an opportunity for change calling out to you right now?